...nor the graph-paper print I've been turning over in my mind. Yet there is something graphical about it...and it's relatively long (20"). The sole concern I have is, it's rayon, which might be prone to wrinkles. But it couldn't be worse than linen, right? I have a linen skirt I love. It tends to get squashed, and I don't care. When I embarked upon this working-wardrobe journey, I wasn't planning on buying a lot of skirts. Old school thought revolves around suits or dresses...but then this is based on the notion that working women are either executives (suits) or secretaries (dresses). Either you have a secretary, or you are a secretary. I've found skirts more versatile than either. The same skirt can keep going, with any number of blouses, cardigans, pullovers, even a nice tee shirt; shoes or boots, stockings or tights. 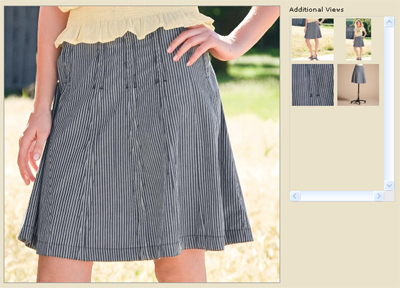 A good skirt can sort of span the seasons. I don't buy trendy skirts such as bubble or maxi, or anything I wouldn't want to wear five years from now (okay, I'm cheap). I can admit I've been a bit mesmerized by the J.Crew website. It's not that the clothes are...different, in the obvious sense. They're not; in fact they're formulaic, classical if you will. They offer virtually the same clothes year after year. Hold the phone! 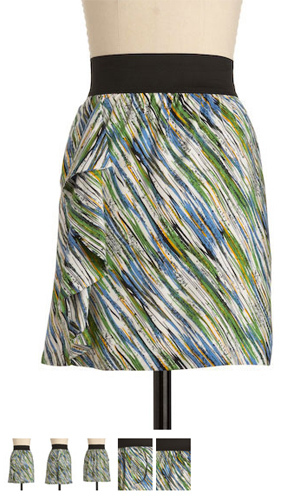 I don't mean the skirt (which is gorgeous). What the heck is she wearing, if it's not little socks and sensible oxfords? with this smashing silk skirt and office-friendly white top? I love you, J.Crew! erm...it's not that I want to wear little socks, it's the idea of pushing the envelope.